A few weeks back, a good friend of mine Robbie reached out to me to ask if I would take some photos of him proposing to his girlfriend. Now, this was no normal proposal, because Robbie is a bit of a musician. 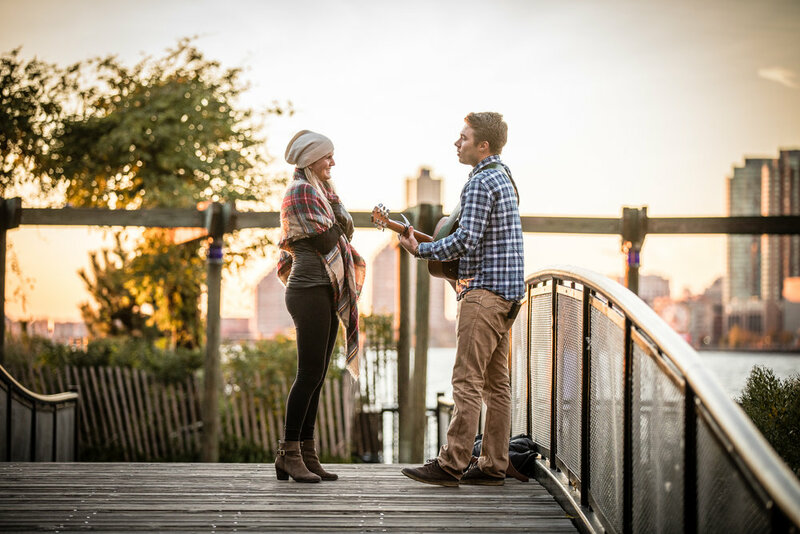 His plan was to take a walk along the water near where they live in New York City, and have his guitar there waiting for him to sing her a song. We met up a few days beforehand to scout locations and finally decided on a small bridge right on the water in Battery Park City. On the day of, I arrived a few minutes early, hid, and waited. As they walked up, saw the guitar, and Robbie started to sing, Ellie knew exactly what was happening. The shoot went off without a hitch (except for almost dropping the ring in the water, but that's another story) and she said yes! This was definitely one of the more fun shoots I have ever done and I hope I get to do more proposals... So, if you know anyone popping the question soon... please put them in touch with me!